A splendid choice as a business gift: a collection of early 20th-century Finnish national romantic orchestral music (...) gorgeous illustrations add to a fine CD product. A successful album, which forms an ideal present for others or yourself. You could not imagine a better visiting card for Finland! This CD + photo album product features a fine collection of 12 Finnish orchestral gems (including Valse triste by Sibelius, Wedding March by Toivo Kuula and Valse lente by Oskar Merikanto), newly recorded under the direction of chief conductor Leif Segerstam. 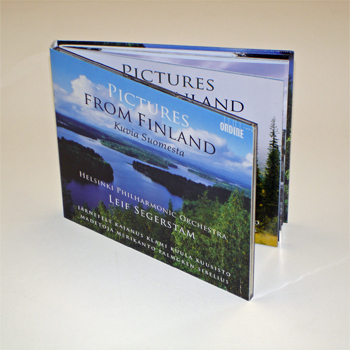 The booklet includes 18 carefully chosen colour photographs of typical Finnish landscapes, which illustrate the inspiration which the featured composers draw from their relationship with Finnish nature. This digipak album was released in 2007 in celebration of the Helsinki Philharmonic Orchestra's 125th anniversary. The Helsinki Philharmonic Orchestra was founded in 1882 and remains the oldest professional symphony orchestra in the Nordic countries. It gave the first performances of almost all the symphonic works by Jean Sibelius (1865-1957) with the composer himself conducting.